A while ago i saw a picture on this forum of a, relativity high, water line put up at Mal Gat by the Sundrift campsite. If anyone knows please could you tell me the length of the line and what gear you used to rig the anchors. 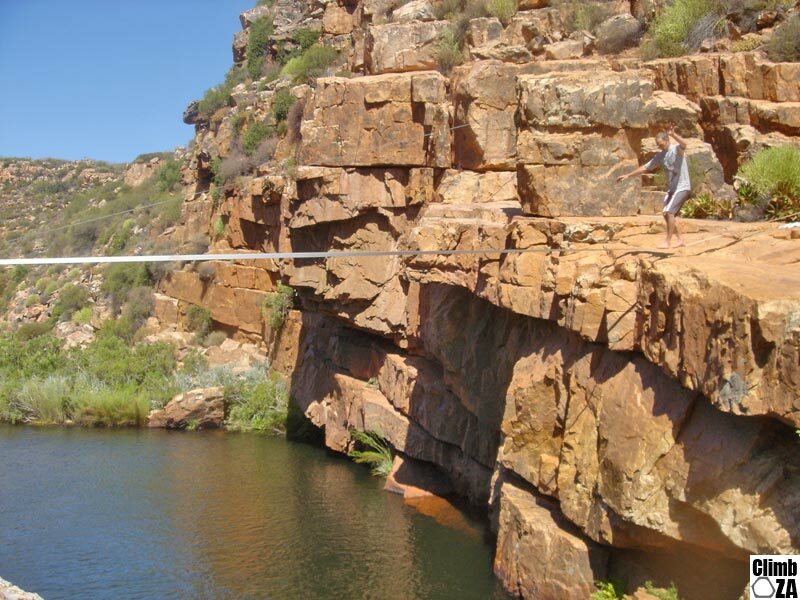 We used about 40m of static to make a zipline from the large block on the ledge near the middle jump to the obvious crack near the spot where you get out, making a line perpendicular to the waterfall. did you walk on that? The article that Justin posted the link to is mine. Have a read if you are planning to walk it, at least for entertainment. The line was probably about 20 meters in length, but it ran for about 3 meters above the ledge on the south side (the side from which I am walking in the pic above), and several meters across the platform on the north side, so you could step off at less than 20 meters. On the south side I used cams in the rails (medium sizes I think). On the north side I predominantly slung a very long sling around a boulder that sits on top of the rock platform and had two pieces of additional gear, I think 1 nut and 1 cam. Its a great line to walk, although the points next to each cliff are a bit hairy. I am back at Sanddrift and the end of this month and I plan to walk again, although this time I will start with a lower line a meter or so above the water. It looks perfectly feasible to rig one basically below the one that I rigged before. When are you planning to do it? Motivated by this wonderful spring weather to put up my slackline across the garden again, and to take breaks from work by walking the line, instead of huddling round the heater with a cup of tea. Having not walked a line for ages, I was very pleasantly surprised at my performance - seems those brain connections, once established, are not lost through inactivity. Being on the line reminded me of some discussion on this forum about the water line over Maalgat at Sanddrif. I remember that there were some people keen to give it a go around March this year. I was planning to do it again in March as well, but managed to sprain my ankle running down from climbing at Wolfberg, and so wasn't able to get on it again. and if so I would be keen to hear feedback about it and would love to see some photos.